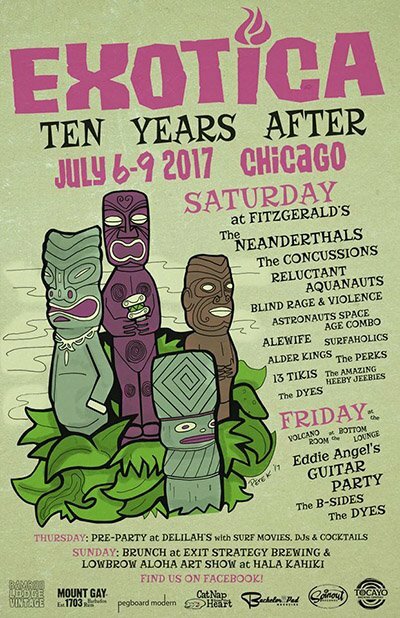 July 6-9 – Exotica 10 Years After featuring the finest in surf, garage and roots music in venues throughout Chicago. July 8 – Tiki Night at The Egyptian Theater in Hollywood. The American Cinematheque’s 13th annual Tiki Night event starts at 1:30 p.m. with a Tiki marketplace and continues into the evening with an exclusive screening of the 1994 film Rapa Nui. 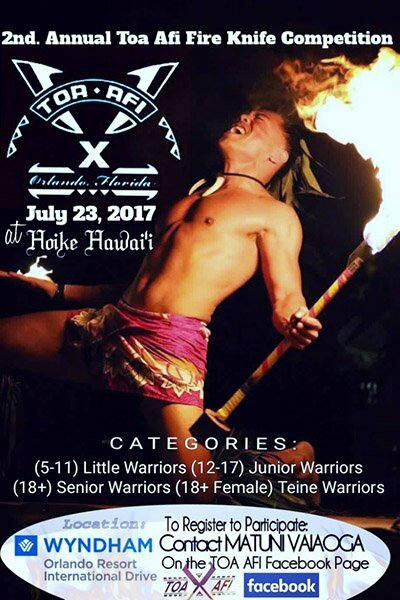 The day’s activities include live music by King Kukulele and the Friki Tikis, performances by the Polynesian Paradise Dancers, Tiki vendors, the Aloha Fridays food truck, and craft Tiki cocktails. July 9 – Surfin’ Sundays at the Huntington Beach International Surfing Museum. 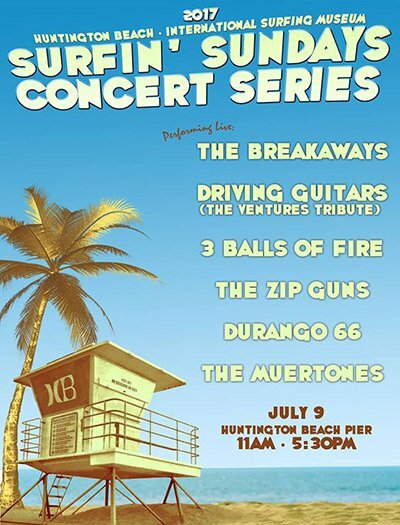 A free, all-ages summer concert series at the Huntington Beach Pier in Southern California. Featuring The MuerTones, Durango 66, Tequila Worms, 3 Balls Of Fire, Driving Guitars (The Ventures tribute), and The Breakaways. July 14-15 – Spirit of Tiki Cocktail Festival in London. This second annual event brings the tropical atmosphere of the South Pacific to Regent’s Park for a celebration of Tiki culture with a focus on rum and exotic cocktails. 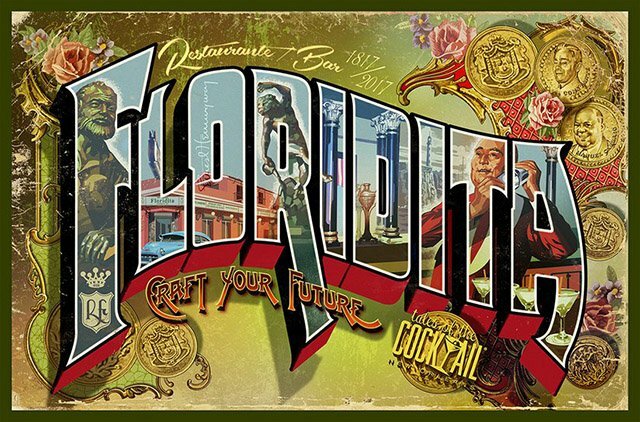 Includes Tiki art, performances, music (including British singer Andy Abraham) and food. Organized by Mahiki bar manager Georgi Radev, rum enthusiast Roger Barnes and global rum ambassador Ian Burrell. July 15 – Tiki Fashion Show at Trader Vic’s in Emeryville, Calif. A showcase of vintage aloha fashions and music from DJ Otto von Stroheim. 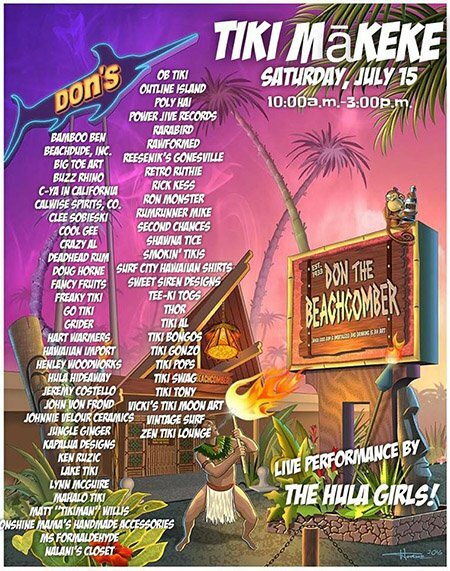 July 15- Tiki Makeke at Don the Beachcomber in Huntington Beach, Calif. More than 60 vendors selling their wares, plus authentic Polynesian music and hula dancers, live bands, food and drinks, plus more. Live music by The Hula Girls. July 15 – Tiki Run in St. Paul, Minn., featuring races (5k, 10k, half marathon, etc. ), costume contest, and post-race party. July 18-23 – Tales of the Cocktail in New Orleans, the world’s largest and most influential cocktail festival. The international spirits community comes together for five days of seminars, parties, dinners, competitions, tasting rooms and product launches. Founded in 2002, it’s the premiere event to learn what’s now, what’s new and what’s next in bartending. Over 15,000 bartenders, brand ambassadors, writers, thinkers, and drink enthusiasts from around the world (35 countries were represented last year alone) are expected to attend.. If you can’t make it to the festivities in the Big Easy, get in the spirit by making the 15th anniversary cocktail: The Parish Fish House Punch. * The ambassadors for Tales of the Cocktail 2017, Dale DeGroff and Audrey Saunders. These New York City legends of the craft cocktail revival have been constant contributors to Tales of the Cocktail, lending their guidance and expertise at events and behind the scenes. There are more than 300 events to choose from, offering something for everyone. We spotted these must-dos for Tiki and rum enthusiasts. * National Daiquiri Day at Cane & Table on Wednesday, July 19. Bartenders from all over the world take turns serving up daiquiris of all shapes and sizes at the acclaimed New Orleans rum bar. Sponsored by Bacardi. * USA Ti Punch Cup Final on Wednesday, July 19. To choose the two spots on the U.S. team competing in Martinique in March 2018, 16 bartenders from around the country compete as attendees enjoy rhum agricole tipples, Caribbean snacks, and tunes while viewing the competition live. Sponsored by Rhum Clément. * The War of the Sling on Wednesday, July 19. Dale DeGroff and Lorenzo Antinori explore the history of the controversial Singapore Sling while some of the most revered global bartenders take turns behind the stick making their own modern versions. Sponsored by Cherry Heering and Death’s Door Gin. * Sailor’s Joy: 400 years of Drinking at Sea on Wednesday, July 19. Jeff “Beachbum” Berry and David Wondrich join forces to delve into the rich history of nautical tippling. No topic will be left uncovered: East India trade, the Royal Navy, pirates, cruising and boozing, plus many more. Banks Five Island Rum will be served. * Feeling the Funk: From Dunder to Wonder on Thursday, July 20. An exploration of the distinctive “Hogo” of Jamaican rums and other spirits, including a hands-on exploration of flavor mapping. Sponsored by Appleton Estate. * Falernum, Shrubs & Mythical Caribbean Rum Liqueurs on Thursday, July 20. Global rum ambassador Ian Burrell leads a discussion about how these special elixers are made, providing tastes of rum liqueurs from Martinique and St. Lucia plus the exclusive premiere of a special Velvet Falernum made for Tales of the Cocktail by JD Taylor and Foursquare Distillery in Barbados. Also participating are Martin Cate (Smuggler’s Cove) and Richard Seale of Foursquare. * Finding Classic Cocktails in the Dusty Archives on Thursday, July 20. Authors Jeff “Beachbum” Berry and Philip Greene take guests on a journey into the dusty archives to explain how to find buried treasure in places you’ve never thought to look. * Rum: Just Sip It on Thursday, July 20. An exclusive tasting that breaks rum’s citrus-and-sugar dependence and shows why it’s pound-for-pound as good as whiskey and brandy for enjoying neat. Featuring Joy Spence (Appleton), Paul Yellin (Rhum Bar & Caribbean Kitchen), Karl Williams (Solomon & Kuff), Richard Seale (Foursquare), and author Fred Minnick. * Tasting of Traditional Pure Rums presented by Foursquare Rum Distillery, Worthy Park Estate and Mezan Rum on Thursday, July 20. Experience the flavors of pure rum – made traditionally by pot still distillation without any additives. * Pusser’s Rum Dynamic Duo with Ian Burrell on Thursday, July 20. A special event at the Rusty Nail featuring the global rum ambassador and the iconic Navy rum. Open to the public. * Diplomatico Rum Dynamic Duo on Thursday, July 20. A special event at Cane & Table featuring Kevin Beary from Three Dots and a Dash in Chicago showcasing Ron Diplomatico’s new Traditions range in classic, vintage and Tiki cocktails. Open to the public. * Bacardi Portfolio Party on Thursday, July 20. Hit the beach at a tropical-themed and immersive cocktail and brand experience at The Sugar Mill featuring special musical guests. * Raising Cane – Rum’s Rise to Respectability on Friday, July 21. Global rum ambassador Ian Burrell, bartender and author Tristan Stephenson, and Bacardi’s Jacob Briars explore why a spirit can be so widely loved, yet so little appreciated. 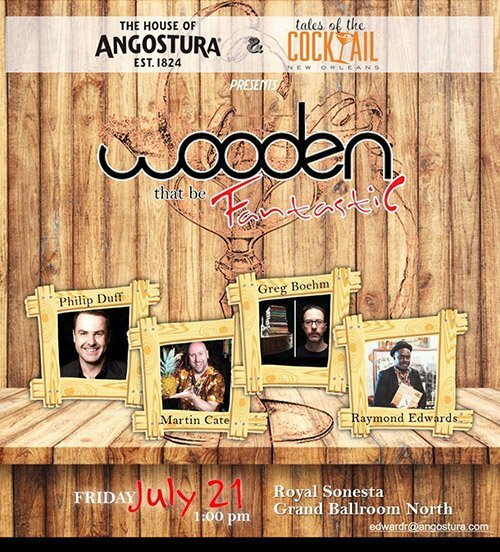 * Wooden That be Fantastic on Friday, July 21. A seminar about wooden tools in bartending featuring Martin Cate (Smuggler’s Cove), Philip Duff, Raymond Edwards (Angostura) and Greg Boehm (Cocktail Kingdom). * Hakuna RUMtata – Tiki Pool Party presented by Bayou Rum on Friday, July 21. Get away to a tropical hideaway at Hotel Monteleone’s rooftop pool for live music and Tiki cocktails, from frozen Hurricanes to the classic Grog. * Moving Beyond Colour: A New Classification for Rum on Friday, July 21. A new way to highlight the difference between traditional and modern distillation methods. Presenters: Luca Gargano (Velier), Alexander Kong (Worthy Park Estate), Richard Seale (Foursquare), Ian Burrell (global rum ambassador), and Peter Holland (The Floating Rum Shack). Sponsored by Altamar Brands, Foursquare Distillery, Smith & Cross Jamaica Rum, Velier SpA, and Worthy Park Estate. 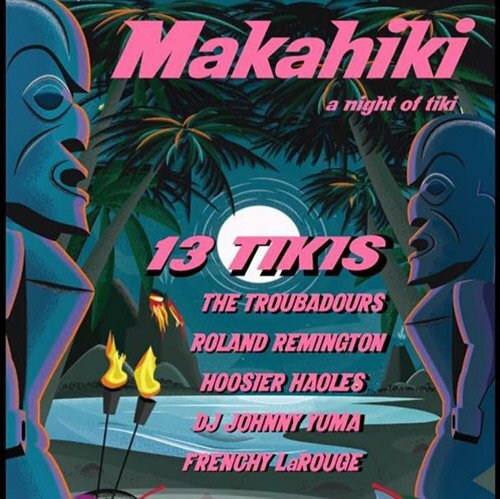 * Forbidden Tales of Tiki on Friday, July 21. A special cocktail event at Tiki Tolteca featuring Julian Cox and Kevin Beary from Chicago’s Three Dots and a Dash. Sponsors: Appleton Estate, Wray & Nephew, Baron Samedi Rum, and Campari. A Dynamic Duo event open to the public. Official results: Check out all the winners below. 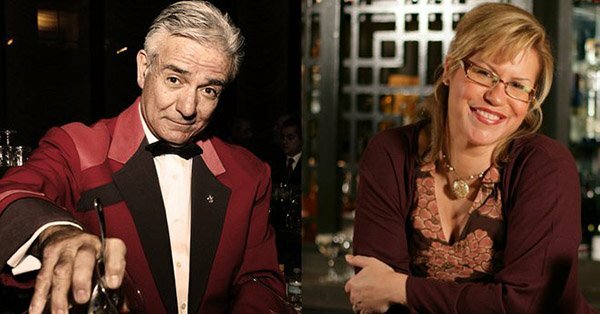 Another great honor goes to Martin Cate and Rebecca Cate for Smuggler’s Cove: Exotic Cocktails, Rum, and the Cult of Tiki (Best New Cocktail & Bartending Book). You might remember Wayne Curtis (Best Cocktail & Spirits Writer) from The Hukilau 2011. 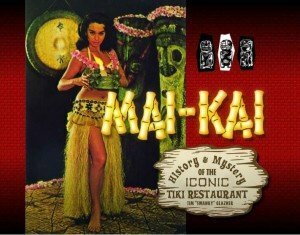 And okole maluna to our UK Tiki friends at Trailer Happiness (Best International High Volume Cocktail Bar). July 22 – The Original Tiki Market Place in Garden Grove, Calif. Featuring vendors, live Hawaiian entertainment, food, friends, and more at the Garden Grove Elks Lodge. 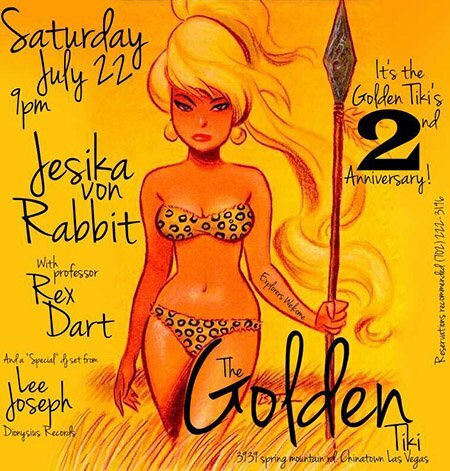 July 22-23 – The Golden Tiki Second Anniversary at the Las Vegas Tiki bar featuring two special parties. On Saturday, “postmodern, intergalactic pop provocateur” Jesika von Rabbit performs live with her costumed choreographed dancers and Lee Joseph (Dionysus Records) on bass. On Sunday, it’s the Terrible Twos Second Anniversary Party featuring the shrunken head of pinup Claire Sinclair. 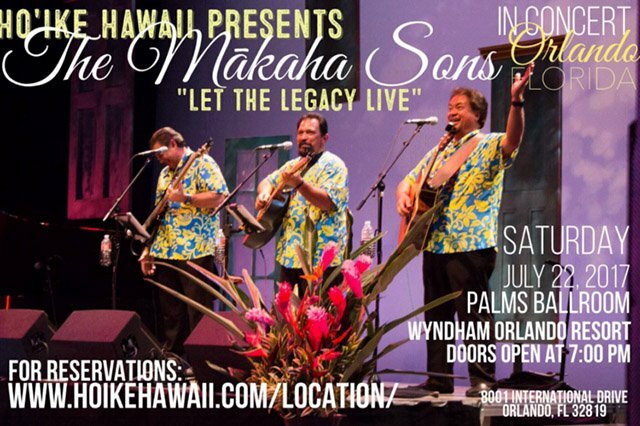 July 22-23 – 20th annual Ho’ike Hawai’i concert and competitions at the Wyndham Orlando Resort featuring two days of hula and fire-knife dancing, plus Hawaiian music from The Makaha Sons, vendors, and more. July 25 – Tiki Oasis Bartenders Battle Preliminary Round at George’s at the Cove in San Diego. A head-to-head Tiki cocktail competition to decide who moves on to the Tiki Oasis finale in August. Also enjoy a Tiki-themed happy hour with drink specials featuring Pusser’s rum and Boy Drinks World bitters. 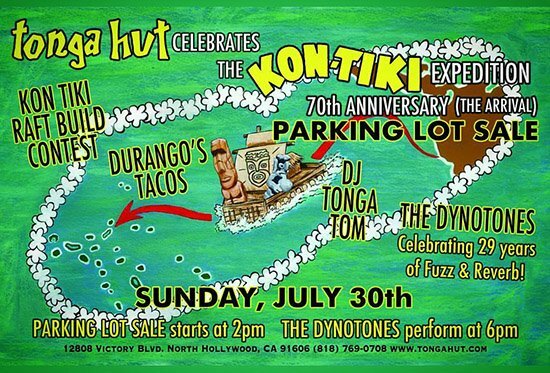 July 30 – Parking Lot Sale and Art Show: Kon-Tiki Expedition at the Tonga Hut in Los Angeles celebrating the 70th anniversary of Thor Heyerdahl’s journey. Featuring artists, vendors, food, DJ Tonga Tom and live music from The Dynotones. 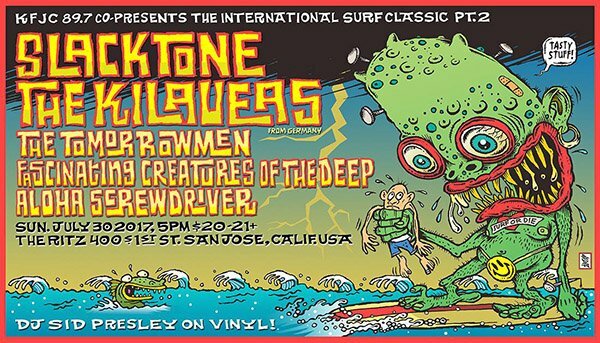 July 30 – The International Surf Classic in San Jose, Calif., featuring Slacktone and The Kilaueas. Also performing at The Ritz: The TomorrowMen, Fascinating Creatures of the Deep, and Aloha Screwdriver. July 1 – Unsteady Freddie’s Surf-Rock Shindig at Otto’s Shrunken Head in New York City. July 11 and 25 – Coconut Club Nights at Clifton’s Pacific Seas in Los Angeles. A mystical evening of elaborate Tiki-inspired cocktails, delicious plates and amusements. 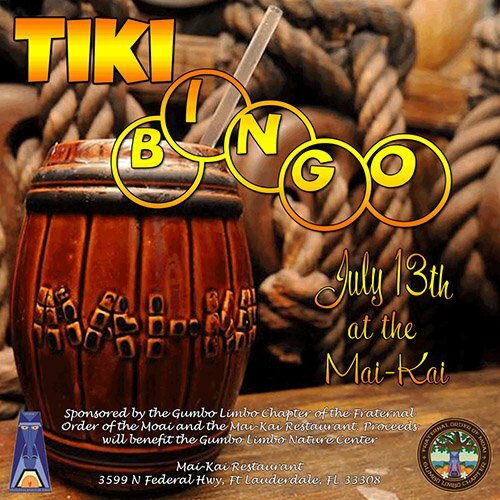 July 13 – Tiki Bingo at The Mai-Kai in Fort Lauderdale hosted by the Gumbo Limbo Chapter of the Fraternal Order Of Moai. A fund-raising event featuring an extended happy hour. Oct. 14-15 – UK RumFest in London. Oct. 14-15 – German Rum Festival in Berlin. This entry was posted in Events, Events, Events calendar, Music, The Tiki Times and tagged Appleton, Audrey Saunders, Bacardi, Beachbum Berry, cocktails, daiquiri, Dale DeGroff, David Wondrich, Don The Beachcomber, Egyptian Theatre, falernum, Foursquare, Ho’ike Hawai’i, Huntington Beach Don the Beachcomber, Huntington Beach International Surfing Museum, Ian Burrell, Jamaican rum, Julian Cox, Kevin Beary, King Kukulele, Lost Lake, Martin Cate, Martinique, Mezan Rum, Navy rum, Original Tiki Market Place, Otto von Stroheim, Paul McGee, Philip Greene, Pusser's rum, Richard Seale, Ron Diplomatico, rum, Singapore Sling, Smuggler's Cove, Spirit of Tiki, surf, Tales of the Cocktail, The Golden Tiki, The Hula Girls, Thor Heyerdahl, Three Dots and a Dash, Tiki Diablo, Tiki Makeke, Tonga Hut, Trader Vic's Emeryville. Bookmark the permalink.